The discrepancies, distortions, lies and inconsistent reporting of July 7th have made it extremely difficult to see how anybody can say with any conviction exactly what happened that day and who perpetrated those atrocities. The Government Narrative is full of vague assumptions yet is supposed to be a definitive account. The July Seventh Truth Campaign has put together a list of the most obvious errors and inconsistencies in the official account so far. There are so many gaps, we had to split the document into two parts. Mind The Gaps Part 1 is here and Mind The Gaps Part 2 is here. It was originally announced that the men had taken the 0740 train from Luton to Kings Cross Thameslink on the morning of July 7th. An eyewitness later stated that she had been at Luton station that morning and that the 0740 never ran that day. Thameslink Rail later confirmed that not only had the 0740 been cancelled but that all trains that morning ran with heavy delays due to problems further up the line. This confirmation first came from Marie Bernes at Thameslink Customer Relations and then from Chris Hudson, the Communications Manager for Thameslink Rail at Luton. When it was later reported that the men had taken the 0748 train, it was found that this scenario could not be the correct one either. The 0748 did not reach Kings Cross Thameslink in time for the men to have made the journey to Kings Cross station to have been captured on CCTV “shortly before 8.30am” as the police stated. The 0748 did not reach Thameslink until 8.42am; seven minutes after the Eastbound Circle Line train had departed from Kings Cross, which later exploded between Liverpool St. and Aldgate. The 0730 train actually left Luton station at 7.42am. Again, this train arrived at Thameslink station four minutes after the first of the bombed tubes had already departed Kings Cross. The men were shown on a single CCTV image taken from outside Luton station, apparently entering the station six seconds before 7.22am, according to the timestamp on the image. On this basis, the earliest train they could have caught would have been the train that left Luton at 7.25am. This train arrived at King's Cross Thameslink at 8.23am. The Government narrative of the London Bombings states that the men caught the non-existent 0740 train and that it arrived at Thameslink at 8.23am. The narrative then says that the men were caught on CCTV at King's Cross Thameslink at 8.26am, whereas it was previously reported that this sighting had occurred at Kings Cross mainline station. The narrative goes on to say that the men were seen again, four minutes later at Kings Cross mainline, where they proceeded to split up in different directions, giving the impression that each man was off to board a tube train. The narrative does not state whether it was a sighting by a CCTV camera or a witness. The quickest route from Thameslink to the tube lines is through an underground subway but the narrative does not specify their alleged route from King's Cross Thameslink station to the mainline station. "The 4 are captured on CCTV at 08.26am on the concourse close to the Thameslink platform and heading in the direction of the London Underground system." However, if they were seen on the concourse of Kings Cross mainline, like the narrative says, then this suggests that the men did not take the subway but took the overgound route, since the subway leads directly to the tube platforms. It is unlikely they would have made the somewhat senseless decision to come back out from the tube platforms and make their way all the way back up to the main concourse just to go back down again and board the trains. But confusingly, the subway route seems to be the only one which could have got them to Kings Cross quickly enough to have taken the trains they are alleged to have been on. Furthermore, the subway from Thameslink only gives access to the Victoria, Northern and Piccadilly lines. Therefore, this route would only have facilitated the journey of Lindsay, who is alleged to have boarded the Piccadilly Line train; the other two men who were alleged to have been on the Circle Line trains would have had to have found an alternative route to the Circle Line platforms, necessitating their splitting up and not being seen together. "At around 08.30am, 4 men fitting their descriptions are seen hugging. They appear happy, even euphoric. They then split up. Khan must have gone to board a westbound Circle Line train, Tanweer an eastbound Circle Line train and Lindsay a southbound Piccadilly Line train. 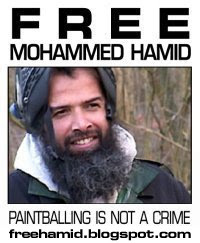 Hussain also appeared to walk towards the Piccadilly Line entrance." TFL Journey Planner advises to allow 6 minutes to transfer between King's Cross Thameslink station and the mainline in the rush-hour, which doesn't allow sufficient time for the accused to transfer between the Thameslink and the mainline stations. There are no reported witness sightings of four men with large rucksacks running. It is extremely difficult to see how Tanweer got to the Circle Line platform so quickly, if he either had to go overground or take a complicated journey to the Circle Line platform from another of the only platforms he could have reached via the Thameslink subway. In conclusion, the incorrect train given by the narrative cannot be put down to simple error. Even if the men had taken a train from Luton which ran that morning, it still would have been extremely difficult, if not impossible, for them to have been sighted at Kings Cross at the time they were said to have been seen, or for them to have caught the underground trains which were later bombed.The narrative even says there were witnesses on the non-existent train who believe they saw the men. How could this be so when there was no such train? The anomalies in the narrative account regarding the train, its arrival time and how the men could have been sighted at Kings Cross only serve to cause much confusion. Peter Power also has connections to former New York Mayor, Rudi Giuliani; he served on the Advisory Board to the Canadian Centre for Emergency preparedness(CCEP), alongside the senior Vice President of Giuliani and Partners, Richard Sheirer, who was also Director of the New York Mayor’s office of Emergency Management, overseeing the rescue and recovery operations following the September 11th attacks. Giuliani and partners is a security consultantcy and Investment Bank and Mr. Giuliani himself, by another coincidence, happened to be in London for a conference and just yards away from Liverpool Street station when the blast occurred there on the morning of July 7th. "The Mossad office in London received advance notice about the attacks, but only six minutes before the first blast. As a result, it was impossible to take any action to prevent the blasts." Netanyahu himself also denied, though, that he had received any such warning, calling the reports "entirely false". Although this report claims that the AP "quickly replaced the story" but they never actually retracted it. Army Radio quoting unconfirmed reliable sources reported a short time ago that Scotland Yard had intelligence warnings of the attacks a short time before they occurred. If there was advance knowledge of the attacks, even if they could not have been prevented, surely it would have been more constructive to have warned TFL Managers and people who could have worked to minimize the resulting confusion – if not the destruction - rather than a politician who was still in his hotel room and would not have been on a tube train that morning. For the comprehensive list of anomalies in the official account of the July 7th attacks, see here and here. The July Seventh Truth Campaign believes there are far too many errors and inconsistencies in the account to simply be attributed to lazy reporting and beaurocratic incompetence. Why does the narrative state the accused men travelled to London on a train which did not run? Did certain people have prior knowledge of 7/7 and if so, why? How could the former head of the CIA state that they had recovered timing devices from the blast sites, yet it later be stated that the bombs were detonated manually? Why was it reported by the authorities that military grade explosives were used, only for this to be swiftly denied within a couple of days? Why does the narrative state that it is still not known what type of explosives were used almost a year later? How is it that the narrative can accept there is no CCTV showing Shehzad Tanweer on the tube platform or the Aldgate train and no witness to attest to his presence, yet state that he 'must have been' there? How were the men identified so quickly on the basis of a couple of credit cards? The narrative should have provided clear answers; instead it has only raised even more questions. It is not an adequate account of who bombed London on July 7th, how they did it and why. The July 7th 'narrative' that Charles Clarke offered the British People instead of a full Independent Public Inquiry has been released. The BBC, Sky News and Channel 4 are all rolling CCTV footage of the accused from 28th June 2005 as if it were from July 7th (indeed the BBC even cropped out the time and date stamp for the full brainwashing effect) when, of course, no footage has ever been released of the four accused of perpetrating the atrocities on July 7th in over ten months since the incidents occurred. Nor has any evidence been released that could convinct anyone in a court of law for what happened. The official Home Office 'narrative' of events. ISC Report into the London Terrorist Attacks on 7 July 2005. The government response to the ISC report. 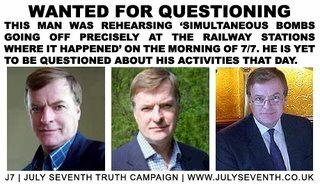 The BBC, true to form, is still using Mr Peter Power of Visor Consultants as an independent security consultant with no special connection to the events of July 7th, even though on the morning of July 7th he was rehearsing bombs going off in precisely the stations that they did. When you're done reading the official confusions see the July Seventh Truth Campaign web site, and the associated July 7th People's Investigation Forum where you can read and join in the analysis and discussion that is shredding the Home Office narrative. The 'real' story of 7/7 - a refutation. 3am Hasib Hussain rolls sleepily from the sofa in the living room of his parents' home in Holbeck, Leeds. Dressed in the grey T-shirt, jeans and trainers that would become familiar to millions, the 18-year-old wanders through the red-bricked terraces of Beeston and waits outside the front door of his best friend, Shehzad Tanweer. There is absolutely no evidence that any of the above scenario occurred. According to his father, Hasib Hussain was last seen by a family member at around 3.30pm on July 6th. On this basis, it cannot definitely be stated at what time he actually left the house, let alone where he went immediately after doing so. 3.15am In a deserted and dark Colwyn Road, Hussain and Tanweer, 22, stand beside a silver-blue Nissan Micra that Tanweer had hired days earlier. Although their movements at this stage are not captured on CCTV, it is thought they are now joined by Sidique Khan, 30, whose role as a primary school teaching assistant in Beeston had earned the respect of those still sleeping in the surrounding streets. The only factual statement here is that they were not captured on CCTV. Therefore, again, how can it be stated with any certainty exactly what they did. Interestingly, the article refers to a "silver-blue Nissan Micra". Are they sure about that? This same newspaper refers to it as a 'blue Nissan Micra' in an earlier report; The Times reported it as a red Nissan Micra; The Mail described it as a 'silver Nissan Micra'. If the media can't even cohesively report on the simple issue of a car's colour, what hope is there for the rest of the story? 3.30am After a short drive across south Leeds, the trio pull up outside 18 Alexandra Grove, Hyde Park. Inside, lying in the bath upstairs, is the bomb-making factory that Khan had put together using recipes from the internet. Primitive in essence, the peroxide-based explosives were made from drain cleaner, bleach and acetone, bought without attracting suspicion in nearby shops. Costing a few hundred pounds, the London bombs, based on a derivative of TNT called triacetone triperoxide or TATP, were paid for by Khan. No evidence exists of support from al-Qaeda. Speculation that the four suicide bombers used the services of an Egyptian chemist studying at Leeds University are dismissed in the Home Office narrative, to be published on Thursday. "There is zero percent doubt this is al-Qaida." He said the Khan tape was produced by the al-Sahab video company, which is controlled by al-Qaida, and the claim of responsibility for the July 7 attacks was done in the same way as its admission of carrying out the September 11 attacks on the US in 2001. Mr Kohlmann said: "I find it a little bit depressing that people don't realise this is al-Qaida's calling card. It shows how little some understand about al-Qaida." Are the public going to receive an explanation for the question of exactly who - if it was not an al-Qa'ida 'claim of responsibility' - edited that video it to make it seem as if it was an al-Qa'ida production by intersplicing the scenes of Khan with those of Ayman al-Zawahri? 3:45am The trio carefully load five identical black rucksacks into the boot of the Nissan Micra. Each contains 10lb of explosive material with detonators packed inside plastic bottles, which in turn are packaged within containers from a nearby garden centre. Interesting that this is the first mention in the media of the containers which were used to carry the bombs in the rucksacks since the The Mail first reported it - and could even name the precise store in which the containers had been bought, which they were able to do by the convenient discovery of the receipt which the men helpfully carried with them. Against the odds, this scrap of paper survived a blast which destroyed train carriages, buses and people. Yet another contradiction: The statement 'five identical rucksacks into the boot of the Nissan Micra' is at odds with an earlier report in this same newspaper which writes of a 'primed' rucksack being found underneath the passenger seat of the Micra. Leaving aside the logistics of fitting a bag that size under a car seat, this suggests that there were not five rucksacks in the boot of the car. Or if there were, one of the men carried two rucksacks. Either that or they took the trouble to move the fifth rucksack from the boot and squash it under the passenger seat instead, a manoeuvre that makes no sense whatsoever. 4am-5am Speed cameras track the car heading south through the city's leafy suburbs. To their left they pass Beeston, where Khan lives, an impoverished district of Leeds soon to become the focus of the world's media. The bombers join the southbound M1 at junction 40 and their progress is tracked as they journey south along the spine of England. Many, many aspects of this statement are completely bizarre. 'Speed cameras track the car'? Unless they were consistently going through every speed camera on their journey at a speed-limit-breaking rate, there is no reason or justification for a speed camera being able to track them. Even if there is an error here and the article actually meant 'Traffic cameras', this still doesn't explain why they were 'tracked'. Who would be tracking them? Who would know at that point what the purpose of their journey was, for their 'progress' to be tracked as they journeyed south? 4.30am Germaine Lindsay says goodbye to his wife Samantha Lewthwaite, 21, heavily pregnant with their second child, and leaves their rented semi-detached home in Aylesbury, Buckinghamshire, in a hired red Fiat. Negotiating the B489, Lindsay arrives at Luton train station around 5am. The 19-year-old attaches a pay-and-display ticket to the vehicle's windscreen, from which DNA would later be extracted to identify his remains. "He left with a holdall and a bunch of door keys. I went to bed. Later that night I'm sure I heard him on the stairs and going into Abdullah's room. He must have been in there in the dead of night to kiss his little boy goodbye. He didn't get a chance when he left because I was angry." This account bears absolutely no similarity to the one above. The issue of the DNA on his car park ticket which was used to identify his remains is also a confusing one. On July 14th, police said that the DNA identification process would "take some time"; yet Samantha says she was told on July 14th that the police had Lindsay's DNA, which was, they said,how they knew he was the perpetrator. 6:30am After 160 miles on the M1, the Nissan Micra turns off at junction 11, arriving at Luton train station car park at around 6:50am. There, amid the first of the day's commuters, is the imposing frame of Lindsay, a carpet fitter from Huddersfield. Like the others, Lindsay is judged in the narrative to have been exasperated by western foreign policy. Palestine, Chechyna and, in particular Iraq, are cited as factors motivating their deadly mission. "They arrived at Luton station at 6.51am, where they met Lindsay, 19, who had been waiting since 5am after travelling in another car." The precision of the time at which they arrived suggests that it was taken from a timestamp of a CCTV camera which recorded them entering the car park. This is presumably how they knew Lindsay had been waiting there since 5am. Yet such footage has never been mentioned or shown. They have been 'judged' in the narrative to have been 'exasperated' by western foreign policy, yet no explanation is given as to how on earth the authorities know this, since the men were not, according to their friends, given to talking about politics. There is also no explanation as to how simple 'exasperation' causes the apparent knock-on effect of becoming a suicide bomber. Thousands of people all over the world, myself included, would have shared this exasperation but would be considerably less inclined to take such drastic action. 7am The four don their military-style rucksacks in the increasingly busy car park. Khan had loaded the Nissan Micra with more explosives than required. Contrary to speculation though, no fifth bomber was ever expected to carry a fifth rucksack of explosives holding two nail-encased bottles that were later found wedged beneath the front passenger seat. In the boot 14 components for explosive devices are also left. CCTV cameras, designed to capture car thieves, film the four engaged in a final prayer. So, 'Khan loaded the Nissan Micra with more explosives than required' but 'contrary to speculation, though, no fifth bomber was ever expected to carry a fifth rucksack'. Why on earth did he do it then? If the men knew, as is being stated by the narrative, that theirs was a suicide mission, what's the use of leaving 'spare' bombs in the car, the only other purpose of which would be to lead the investigation very quickly back to the men. 7.21am Looking like day-trippers, the four stroll onto the southbound platform of Luton station. Leading the group is Hussain, his hands tucked in pockets. Lindsay follows, his white trainers poking from beneath a pair of loose jeans. Khan comes next, with only a white cap visible. Bringing up the rear is Tanweer, who had spent the previous night playing cricket. Tanweer appears relaxed, his rucksack slung over one shoulder. All of this is based on the extremely suspect single frame CCTV image of the men entering Luton station. Aside from the anomalies of the image itself, it is a strange thing that the police only released this one, single image of the men together, in comparison to the myriad moving footage we were allowed to see for the so-called 'dummy run'. A plethora of evidence for a day that doesn't mean a thing and only shows that three of the men apparently took a trip to London, visiting none of the locations which were bombed on the 7th - but for the actual day itself, one blurred still image - where one can't even distinguish their facial features. 7:40am The four bombers catch a Thameslink train, which winds through the affluent commuter belt of Hertfordshire towards King's Cross. As repeatedly pointed out, this train journey is physically impossible: See here. 8:26am The quartet are captured walking across the concourse of London's busiest station. They are chatting; Hussain is laughing. Minutes later, they are huddled in a final, earnest conversation. This footage has never been shown. 8.42am Tanweer catches the Circle Line east towards the heart of the City, entering the second carriage of six on train number 204 where he stands by its rear sliding doors. Not one eyewitness has ever backed up this story. Aldgate survivor Bruce Lait, who was in the bombed carriage, said he did not see anybody of Tanweer's description in the carriage. 8.43am Khan boards Circle Line train number 216 headed west. He stands by its first set of double doors in the second carriage. "He was sitting by the first door of the train and I was standing about 10ft away. I noticed him reaching into his bag and he didn't say or do anything. He wasn't agitated or fidgety, he was very calm. He looked at me and looked around the carriage. Then he pulled some sort of cord." According to Mr. Biddle, Khan was sitting - not standing. Furthermore, his description of Khan pulling 'some sort of cord' differs from what 'senior police sources' told The Guardian, which was that the bombs were triggered by 'button-like devices'. 8.49am Lindsay gets onto Piccadilly Line train number 311 travelling towards the West End and stands by rear doors in the front carriage. The train is described as 'extraordinarily full'. More than 900 passengers are crammed on board. Hussain, meanwhile, waits for a Northern Line service towards Camden. There are several inaccuracies here. TFL stated they had made a mistake with the train number they originally gave as 311 and revised it to 331. This was verified by researcher Bridget Dunne. Why is this story still giving the train number as 311? The train was described as 'extraordinarily full'; an anonymous witness told a survivor that he had tried to board the train behind Lindsay and could not get on, the train was so full. In a few seconds, Lindsay had managed to board the train and fight his way down to the end of the carriage, carrying a large rucksack. The claim that Hussain waited for a Northern Line service is an odd one. It was stated on the day that the Northern Line was not running, and that had it been, the assumption was that Hussain would have boarded a train on that line in order to form some kind of 'burning cross' through London. This was based on a dubious claim of responsibility from an 'Islamist' website, calling itself the Secret Organisation Group of al-Qaeda of Jihad Organisation in Europe. None of this stands up now, since this article is claiming al-Qa'ida had nothing to do with the London Bombings. In addition, the Northern Line was running that morning, along with other lines on which Hussain could also have taken a Northern bound train. 8.50am Tanweer places his rucksack on the floor around 40 seconds after the tube pulls out from Liverpool Street. Twenty feet below Spitalfields' historical streets, the cricketer detonates his device. Yards away, Michael, a consultant, witnesses a 'flash of orange-yellow light and what appeared to be silver streaks, which I think was some of the glass going across.' Then, silence and darkness. Smothered in blood, Michael assumed he was dying. Again, speculation. Nobody has publicly said they saw Tanweer, regardless of where he might have placed his rucksack. 8.51am Khan lowers his rucksack onto the floor next to his carriage's rear sliding doors less than 20 seconds after the train leaves Edgware Road station. Moments later, passengers recall 'an orange fireball' sweeping through carriages. John McDonald, a teacher, standing yards from where Khan killed himself, said: 'Small splintered pieces of glass were sticking in my head and face. I could not breathe; my lungs were burning.' Above ground, London Fire Brigade receive the first emergency call. Where is the witness who saw Khan 'lower his rucksack on the floor'? Or indeed, any witness other than Danny Biddle, who states that Khan was sitting with his rucksack on his lap. 8.53am Lindsay's delayed train leaves King's Cross three minutes after the bombers' agreed deadline for simultaneous detonation. Train 311 has travelled just 261m towards Russell Square when Lindsay detonates his pack 20m below the district of St Pancras. Again, passengers hear a violent bang. For the third time in a matter of minutes, pitch blackness descended on a packed crowd of tube passengers. The train sat at the station for four minutes? Why should this be so? For the incorrect train number, see above comment. Again, no eyewitness has stated they saw Lindsay apart from the anonymous person mentioned previously who apparently saw the back of his head when trying to board the train behind him. No other comment to make here other than the continued question of why Khan is definitively described here as the bomber, when this has never been publicly confirmed by the authorities. He is still referred to as a 'suspect'. 9am A broken-down train having thwarted his intention to catch the Northern Line, Hussain resurfaces, looking bewildered and bemused, onto the King's Cross concourse and stumbles into the first signs of pandemonium. The teenager wanders absent-mindedly into Boots the chemist before leaving the station. See above for comment regarding the ability of Hussain to have caught the Northern Line train. The reference to Boots is based on the fact that a CCTV still of Hussain apparently exiting Boots was released the day after the Bali bombings last year. This image was captured at 9am exactly, according to the timestamp. The reference to the 'pandemonium' is presumably regarding the fact that the station was already being evacuated by the time this photo was taken. There are no signs of 'pandemonium' in the picture. 9:06am Inside train 206, passengers check bodies for a pulse. At least four are deemed dead. As the dust clears, a shaft of light illuminates Stan. His shirt has been blown off, the lower half of his charred body disappears beneath the mangled train floor. 'It was very peaceful and serene. The maintenance light from the tube threw a soft beam of light onto Stan's face,' said McDonald. 9.10am Emergency services are called to the underground. Moments later, the capital's alert system, devised in the wake of 9/11, is activated. 9.12am Passengers from train 204 fumble through the tunnel to Liverpool Street, past the twisted remains of the second carriage. Michael remembers bodies on the track. 'Two were motionless; one was just showing signs of movement.' In the gloom, he passes a woman blankly cradling the head of a hideously injured commuter. 'The whole body dynamic looked wrong, the way the lady was lying.' She is Martine Wright. She has lost both her legs above the knee. For another hour the 33-year-old will be held in the gloom, the last person to be pulled alive from the Aldgate tube bombing. This fails to mention that some passengers made their way to Aldgate station and some exited at Aldgate East, giving some initial confusion as to where exactly the train had exploded. A 'mysterious' power surge? Why were the public initially told that a power surge had occurred on the underground, even though the National Grid denied it immediately? Even allowing for the confusion of the event, it would surely have been apparent very quickly that it was not power surges. 9:16am First passengers to escape train 311 reach Russell Square after 15-minute walk through tunnel. Many are injured, some have blood pouring from their ears. Commuters claim no ambulance or doctors are waiting for them. Chaos descends upon the capital. Metropolitan police told by the underground control centre that explosions have occurred. No ambulances or doctors waiting, despite the knowledge of an underground incident. Survivor Angelo Power described an agonising 30 minute wait before passengers were allowed to leave the train. 9:10am Hussain wanders along the gridlocked Euston Road. He calls Khan. There is no answer. He dials Tanweer. Again nothing. Lindsay, too, is incommunicado. He leaves messages for all three, the youngster's tone increasingly frantic. At the same time, TfL change their explanation of events from 'power surge' to 'network emergency'. Scotland Yard announce there have been seven major 'incidents'. In other reports, Hussain was alleged to have made the phone calls at 9am. Since he was pictured leaving Boots at 9am this would not be possible. He was also reported to have been eating in McDonalds when he makes the calls. This does not match up with a report in The Times that investigators could tell Hussain was walking fast as he made the calls. 9:30am More than 150 bleeding and soot-smothered passengers emerge from Edgware Road station and congregate outside a nearby Marks & Spencer store. Former fireman Paul Dadge ushers Davinia Turrell, 24, from the scene as she clutches a surgical burns mask to her face. The photograph of the 'mask woman' becomes the first iconic image of 7 July. 9.33am Half-a-mile-away Hussain boards number 30 bus which has been diverted off the now closed Euston Road. As the double-decker crawls south along Woburn Place, Hussain sits down at the rear of the upper floor. Some reports claim that the number 30 was the second bus that Hussain had taken, after previously boarding another on the Euston Road. There are no witnesses who saw Hussain on the bus. One claimed to have seen a man with a rucksack, but in the pictures taken in the immediate aftermath of the bus explosion, there are at least two men with rucksacks seen standing on the upper deck. The only person who claimed to have seen Hussain was Richard Jones who quite clearly, from the description he gave of the man he saw, did not. 9:38am Bus passengers note a peculiarly distracted 'man of Mediterranean appearance' who keeps dipping into his rucksack at the rear of the number 30 bus to Hackney. As stated above, the description given by one passenger in no way describes Hasib Hussain. 9.40am British Transport Police announce major incidents on the underground at five stations. Scores of ambulances arrive at affected stations. 9.47am Bomb explodes on number 30 bus in Tavistock Square outside the British Medical Association. Two minutes later, police receive a 999 call from the scene. 'There's people lying on the road. There's people trying to get out. I think there's an ambulance on the way, but there's people dead and everything,' said one. Oddities regarding the bus explosion here, and here. There is also the strange identification of Hussain due to the injuries he apparently sustained due to the force of his strap-on explosives. Yet he was supposedly carrying his bomb in a rucksack. Here the Home Office narrative ends. Within hours, Islamic terrorist groups attempt to claim responsibility. That the perpetrators might be four British men acting alone is not contemplated. The idea that the men were acting alone was 'not contemplated'. Well, it wasn't - until the revelation that the suspected 'mastermind', Haroon Rashid Aswat was an MI6 asset. 10.00pm More than 12 hours later, in the lounge of a terraced home in Holbeck, Leeds, a mother is fretting. Her teenage son was meant to be in London for a night out with 'mates'. Unable to contact him, Maniza Hussain contacts Scotland Yard's missing persons helpline. The police get their first break. In fact, Hussain had not told his mother he was going to London for a 'night out' but had told his parents he would be back on Thursday.